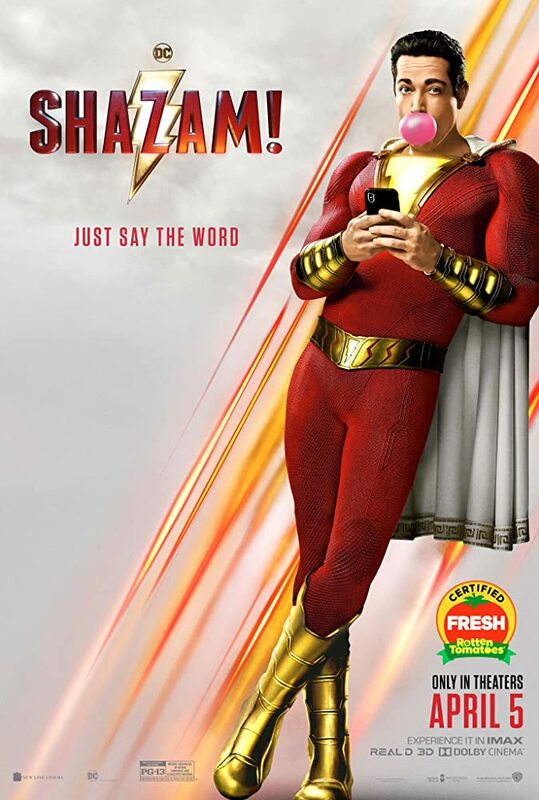 Myself and Ashley went to see the latest movie to come from the DCEU, Shazam! staring Zachery Levi in the title role. The movies starts out in the 1970’s before moving to present day. Asher Angel plays 15 year old Billy Battson , a kid who has bounced from foster home to foster home, since getting separated from his mom as a small child. Djimon Hounsou plays the wizard who bestows on Billy, the powers of the Gods. A lot of the movie is spent where Billy(in the form of Shazam) tries to figure out what his powers actually are. This leads to plenty of funny moments as Billy and his foster brother “Freddy Freeman” played by Jack Dylan Grazer videotape and upload to YouTube different attempts to do things such as fly, and test Shazam’s strength. Freddy is a “cripple” who walks with a help of a crutch, and feels that he is “invisible” despite the fact that his mouth runs at a mile a minute and he has knowledge of practically every DC superhero. Lets just say his character gets very annoying rather fast, the other foster siblings really don’t do much till the end of movie, but they do show Billy that despite all being different, they have become a family. Mark Strong(Kingsman 1&2) plays the villain Dr. Sivana, and he is excellent at the role. He steals the eye of Sin, and becomes the living vessel for the 7 deadly sins. By having at least one of the 7 deadly sins residing in his body at all times, he can do pretty much everything Shazam can do, and bests Shazam the first time they meet. The biggest difference with this Movie and the others in the DECU is the color scheme and tone, it is tons lighter and funnier than the Zack Miller films, and is a really good step away from the muted greys and blues. It pushes way past the humor shown in Suicide Squad and Aquaman. If I had to compare it to an entry in the MCU, I would pick the first Ant-man, and that is a good thing for the DECU and Warner. The movie has a surprise cameo at the end, along with a mid credit and end credit scene. pay attention to the mid credit scene as it sets up the sequel, which has already been green lit by Warner Brothers.